Wellesbourne Wings & Wheels has been an annual fixture on our household calendar for a good few years now, and it’s been great to see how the day has grown and flourished (even if the weather hasn’t always been on our side … though this year wasn’t the worst by any means). This year was a very special one for XM655, celebrating both her 50th birthday (well, 50 years since she entered RAF service) and the 30th anniversary of her arrival at Wellesbourne. As such, the delta lady and birthday girl looked absolutely fabulous – if I can be in half as good condition when I reach her age, I’ll be very happy indeed! Due to the special anniversaries, she did two storming fast taxi runs, one in the morning and one in the afternoon – lifting her nose wheel each time, much to the delight of the crowds gathered. As usual, after her taxi runs, the public were allowed up close and personal with her: she really was the centre of attention. 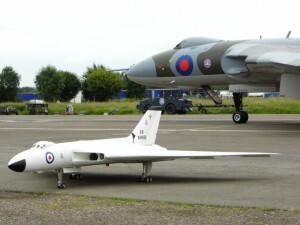 Though XM655 didn’t fly, the superb large model of Vulcan XH558 in anti-flash white performed a wonderful display. Not only is the detail of this model absolutely amazing, it sounds fantastic: from a distance you could almost kid yourself you were watching a real one. Other highlights? As usual, the classic car display was wide ranging and excellent – everything from Mazda MX5s (a subject of some debate when one won the best classic of the day …) to some 1960s Auto Unions (early Audis), a selection of very nice Triumph TR6s, TR7s and TR8s, an Audi Quattro, a couple of Morgans and even a replica of Rickard Rydell’s 1990s BTCC Volvo 850 estate to cover just a few. There were also a few classic fire engines, and an unusual Berlin camouflage Land Rover 110 (I do have a soft spot for Landys). I heard there were over 250 cars on display, which is tremendous. It was also fun to see the classic motorbike display expand a bit: a variety of metal, from a 1970s Moto Guzzi, to a 1980s BMW and a very nice Royal Enfield to some cracking BSAs. Not many aircraft seemed to be on static display, but there was a very pretty Dragon Rapide that stopped by, plus a wonderful Jet Provost that did a great series of flypasts over the airfield. The RAF BBMF Dakota came and did a few low passes, which went down very well with the crowds gathered. Tony Blackman was also present, selling copies of his new book Vulcan Boys (a fascinating read, if you haven’t already got it) and giving £3 for every book sold there to XM655MaPS. There were also several ex-V-Force faces around on the day. 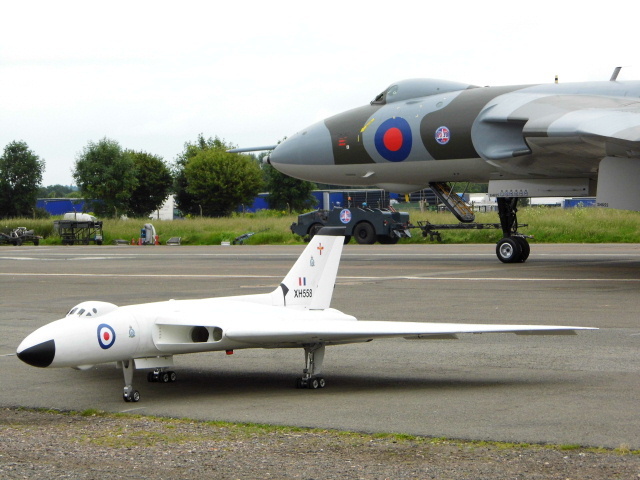 Of course, it was good to see a few of the #twitterVforce team and have a natter – maybe next year we should have an official tweet-up and put some more faces to Twitter names (seeing as I never make tweet-ups at airshows as I’m too busy gawping at the planes!). And not to mention all the various stalls and attractions, selling everything from books to aviation art, to food and drink, to cake (very important! ), to Wellesbourne Aviation Museum (a small but fascinating place). Plus, Coventry Aviation Museum’s Shackleton cockpit was there for people to look in. Many thanks to the team at XM655MaPS for putting on a great day, and for all their hard work looking after XM655. The condition she’s in is a wonderful testament to their care. We’re looking forward to next year already!